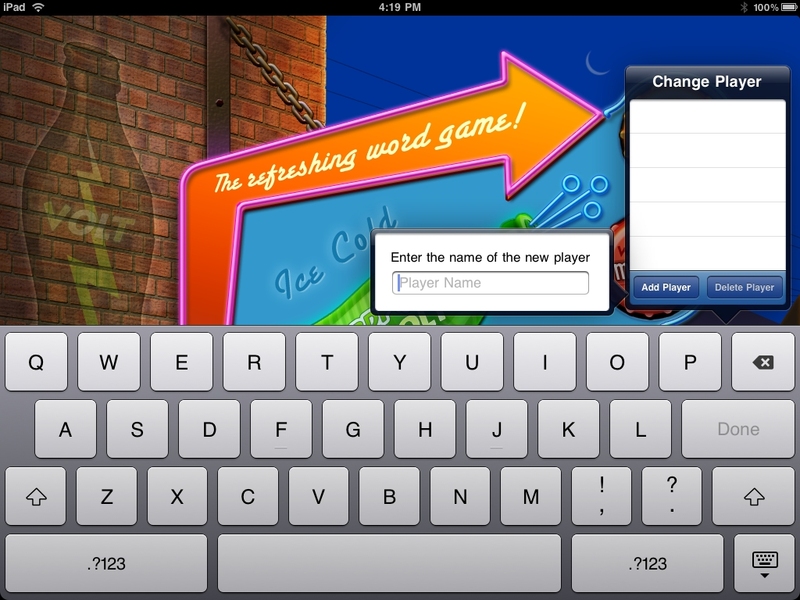 Last week, on May 13, we submitted an update to WordPop! iPad to Apple. We were excited about this new release because it supported landscape. 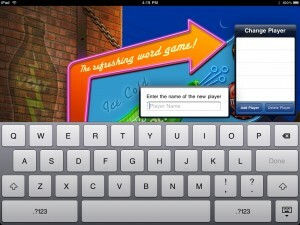 Players would be able to enjoy WordPop! Volt on the iPad in all orientations. I personally really enjoy playing in landscape mode a bit more than portrait as I find holding the iPad horizontally easier. My team and I are aware of the one popover limit but the second popover is a dialog which I did not consider in the same class as a popover. Additionally, Apple had approved the two previous submissions of WordPop! Volt which has “Add Player” working exactly the same way. Apple has been very good to us in that they usually provide a screen shot and description of what is wrong. The fix is straight forward, we need to remove the first popover “Change Player” when “Add Player” is selected. This should be done any second now and we will resubmit. Lesson learned, it does not matter what Apple calls the widget being used in the iPad User Interface Guidelines, only one “popover” at any given time. 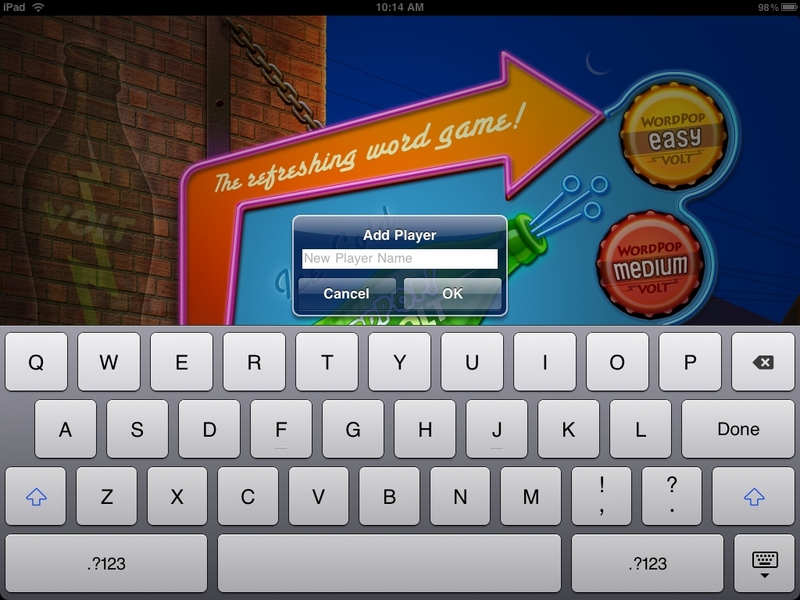 Update: May 24, 2010 – We resubmitted WordPop! Volt. Below is a screen shot on the change. This new look conforms to the iPad UI guidelines. 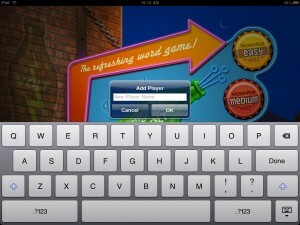 This entry was posted by Todd (Admin) on Thursday, May 20th, 2010	at 12:28 pm	and is filed under development, iPad, Smart Box Design, WordPop	. You can follow any responses to this entry through the RSS 2.0	feed. Both comments and pings are currently closed. Don’t leave us hanging — what is in the update? I would suggest that you consider making the Change Player popover wider, and then when you click Add Player, slide up the list of players (if necessary) and have the Add player instructions and form appear at the bottom of the Change Player space. I don’t see the need for a separate popover. We are back at the bottom of queue for approval. I agree with you on the design, however, we will be integrating sign-in using game art and will abandon the Apple widgets. So I want to leave the code as is for the next step. The second popover will have a cancel and enter button, which I thought was needed. I just realized I did not answer your question. Landscape, more sound effects, and some UI tweaks are in this update. It is a big one for us. I love playing WordPop! in landscape mode and can’t wait for it to be approved. Landscape version accepted by Apple today and is now in the iTunes store. Free upgrade for all past users. The team is really proud of this release and it adds even more value to the game.